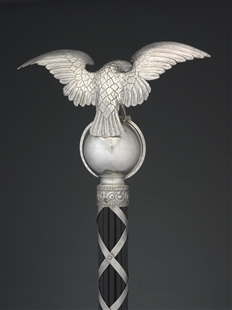 The silver mace, symbol of the House’s authority, has been in use in the House since 1841 when the Members met in the old House Chamber. 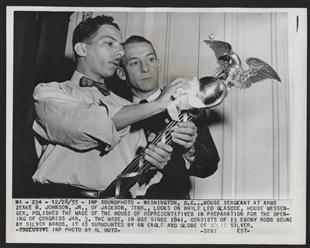 It was crafted by William Adams, a New York silversmith. 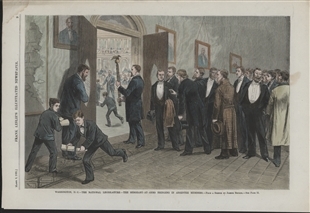 The original mace had been destroyed when the British burned the Capitol in 1814, and during the intervening years, a wooden mace was used. The mace is made of 13 thin ebony rods representing the original states. 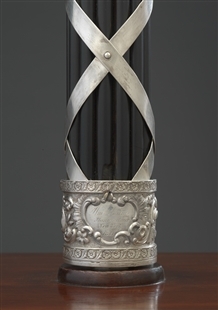 The rods are bound together by the twining silver bands, which are pinned together and held at the top and bottom of the shaft by repoussé silver bands. The inscription “Wm. Adams/Manufacturer/New York/1841” is engraved on the bottom band. 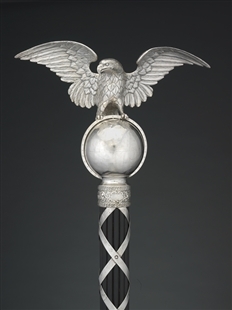 A silver globe with an eagle perched on it sits at the top of the mace, with the Western Hemisphere facing front.